Police searched southern France on Tuesday for an expert gunman suspected of fatally shooting seven people in the head at close range in attacks that may have been motivated by neo-Nazi ties or grudges against minorities. The shooter is suspected of carrying out three deadly attacks: leaving four people dead on Monday at a Jewish school in Toulouse, three of them young children; killing two French paratroopers and seriously wounding another last Thursday in nearby Montauban; and fatally shooting another paratrooper in Toulouse on March 11. All the victims in the school attack were Jewish with duel French-Israeli citizenship, and the paratroopers were of North African or French Caribbean origin. The shots were fired at such close range that the gunfire burned the skin, prosecutor Francois Molins said Tuesday. "We are confronted with an individual extremely determined in his actions, an armed individual who acts always with the same modus operandi," he said, "in cold blood ... with premeditated actions." He added the crimes appear to be premeditated due to the killer's "choices of victims and the choices of his targets" — the army, the foreign origin of the victims or their religion. The killer could "act again," he said. Interior Minister Claude Gueant described the suspect as "someone very cold, very determined, very much a master of his movements, and by consequence, very cruel." However, his suggestion that the attacker was wearing a camera around his neck that could be used to film and post video online was described by the prosecutor as "a hypothesis." Norway's Anders Behring Breivik, the right-wing extremist who killed 77 people in a rampage last year, had suggested in an online manifesto before the killings that a camera could be used to film such "operations." There was no mention in his indictment that he used one. On Tuesday night, the school attack victims were being flown to Israel for burial there, accompanied by French Foreign Minister Alain Juppe. A funeral service is being held Wednesday in Montauban for the paratroopers. All three attacks — which also left a paratrooper and a teenage boy seriously wounded — were carried out by a man on a powerful Yamaha motorcycle who was wearing a helmet and carrying a Colt 45, Molins told reporters in Paris. But he said other clues to the killer's identify were scarce. Molins noted that the attacks had occurred every four days, but said he could not address security arrangements that might be in place Friday — the fourth day after the attack on the Jewish school. President Nicolas Sarkozy has raised the terror alert for the southwest region to scarlet, the highest level on the four-color scale that automatically added 14 new units of riot police and gendarmes to the region. Hundreds of extra police will be on duty Wednesday for the funeral services of the three paratroopers and Sarkozy will speak. More than 200 specialized investigators, including psychologists and profilers, are on the case and "no clue will be abandoned or neglected," Molins said. Hundreds of people have been questioned, but no one has yet been detained and no searches carried out, he added. 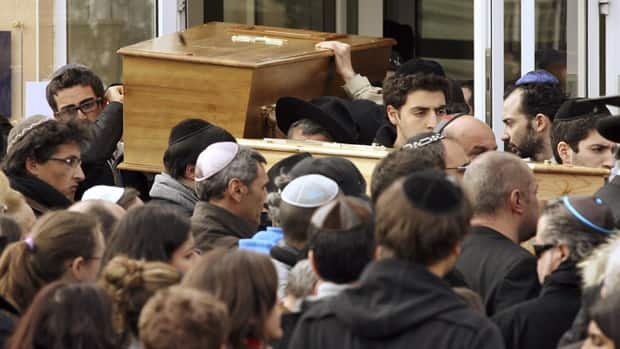 The manhunt took place as friends and family tearfully mourned the four people slain Monday at a Jewish school in northern Toulouse — a rabbi, his two young sons and a young girl. A "monster" is on the loose in France, Sarkozy declared, vowing to track him down. "There are beings who have no respect for life. When you grab a little girl to put a bullet in her head, without leaving her any chance, you are a monster. An anti-Semitic monster, but first of all a monster," he said. The focus fell Tuesday on three paratroopers who had been expelled from their regiment near Toulouse in 2008 for neo-Nazi sympathies, a police official said. The prosecutor said that track was among those being studied. Investigators also are checking the hypothesis that the killer could be a former soldier with psychological issues or with racist and anti-Semitic motives. The killer has shown he can handle large-caliber guns with expertise, leading some to suspect he had a military or police background. 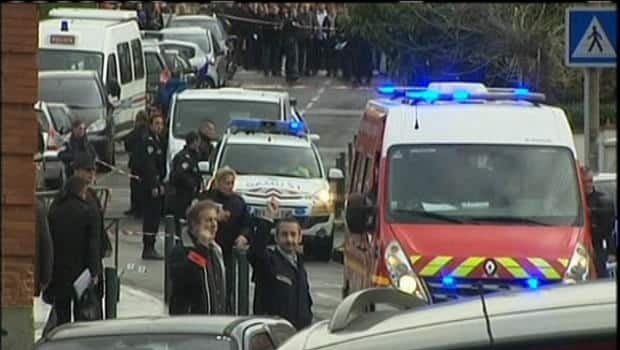 France was reeling Tuesday after the school attack, the deadliest school shooting in the country and the bloodiest attack on Jewish targets in decades. Schools across the country — and French schools around the world — held a moment of silence Tuesday to honor the victims. The French Football Federation said that a minute of silence in memory of the victims was being observed before each match in the French Cup quarterfinals on Tuesday and Wednesday night. In Monday's shooting, the attacker first gunned down a rabbi and his two young sons, then chased down the daughter of the school principal, shooting her dead at point-blank range. Reports of the children's ages varied, with the Israeli Embassy saying Tuesday the boys were three and five and the girl was eight. At the site of the second paratrooper killing, police found the charger for the gun used in all three attacks, but discovered no fingerprints or DNA on it, a police official said. Police are studying the online communications by the first paratrooper killed. He was shot March 11 after posting an announcement online to sell his motorcycle, the police official said, and investigators believe the gunman responded to the ad and lured the paratrooper into an isolated place to kill him. Behavioural analysts are helping with the investigation, the police official said, and comparing the actions of the suspected perpetrator to those of serial killers and to those such as Norway's Breivik. Wails and weeping filled the air Tuesday as the school honoured the victims, including the rabbi who taught there. Several young men pressed their heads against the rear window of a hearse in grief as it drove away. The rabbi's widow covered her face and held her remaining child, a one-year-old daughter, dressed in a bright pink dress. The widow's uncle, Marc Alloul, described how the girl woke up in the middle of the night after the killings, calling out, "Papa! Papa!" Sarkozy, who has played up nationalist themes in his bid for a second term in upcoming elections, sought to stress the overall horror of the crime. "The children are exactly like you," Sarkozy told junior high school students in Paris after joining them for the moment of silence. "That could have happened here." He spoke at a public school across the street from a memorial to the French people who helped Jews during the Holocaust, when most of France was occupied by the Nazis. Sarkozy ticked off potential motives to the children. "Is it because they had come back from Afghanistan? Is it because they came from visible minorities? We don't know," Sarkozy said of the paratroopers who were killed. The French Defence Ministry has said the paratroopers did not serve in Afghanistan, but one family says their son did. Other families have refused to comment on the topic. France is holding a presidential election on April 22, with a runoff expected May 6, in which issues about religious minorities and race have gained prominence. Sarkozy, a conservative, is known for his hard line against increased immigration. Sarkozy also met Tuesday with members of France's Jewish and Muslim communities. France has western Europe's largest population of both Jews — about half a million — and Muslims — about five million. In Toulouse, France's bustling fourth largest city, streets were emptier than normal. In one main square, Place Wilson, a dozen police officers patrolled, some guarding the subway entrance. 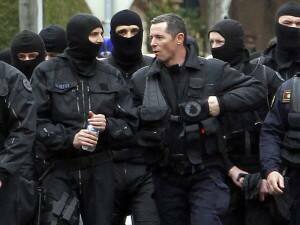 In Paris, police bearing automatic weapons stood in front of Jewish schools. "It's impossible not to imagine the worst because it can happen to any child in France," said Mendy Sarfati, a father dropping his three children off at a Jewish school in Paris. "We want to put this drama behind us and for the French Republic to draw lessons from it."